We had such a great harvest in March, from both hives, but then left it too long before checking them again. One month later the ‘billabong hive’ had turned quite aggressive, with both of us getting stung through our suits. On checking the brood box, we found queen cells, no sign of a queen, and no sign of brood either. We did only check the 6 centre frames but by then really needed to close up the hive as we were getting seriously attacked! The frames looked pretty empty, apart from some that had plenty of pollen and money in them. So, stings treated and up to the kitchen hive to check. 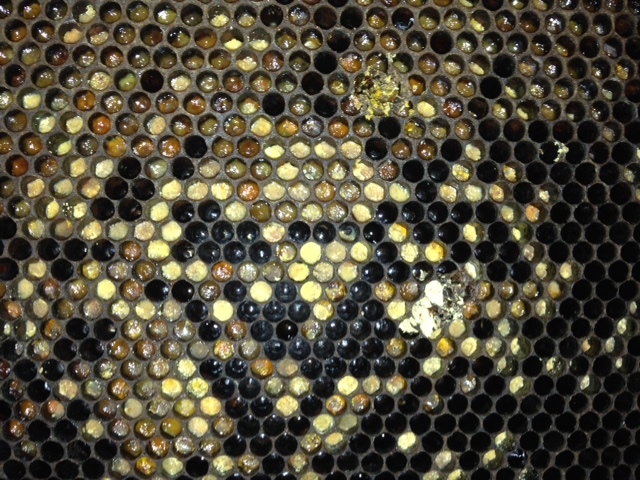 This hive was looking better, so we removed a frame of brood (getting stung for our trouble again!) and went back to the billabong hive to replace an empty frame.